Having hair in the armpits is socially acceptable in many countries, whereas in the Philippines, it is culturally ingrained that women prefer it hairless. So most Filipinas do the usual plucking or shaving. I am the latter. Being busy most of the time, I prefer shaving since it is fast and easy, unfortunately, over the years I developed a what you called a "chicken skin." Whenever you shave your armpits, the skin where the hair grows protrudes visibly thus becoming similar to a chicken's skin when you remove their feathers. That being said, my armpit was not a pretty sight to behold. Then I discovered waxing. At first, I find it to be impractical and inconvenient. My first waxing experience was with my cousins. That didn't end well. Then the most consistent was cold waxing. The pain was tolerable, but I have to deal with appointments and visiting the waxing salon. Because it was inconvenient for me, I started plucking or shaving. Most of the time shaving. A few years later, a new waxing salon in Cagayan de Oro City opened - Hey Sugar Waxing Salon. This time I can't really deny that I was so giddy about it. The word organic and all natural were the phrases that made it so appealing for me. Because I don't know if it comes with age, but I have been very sensitive lately. I don't like trying things that might give me allergic reactions. Then I found out that Hey Sugar Waxing Salon offers hot sugar waxing using organic and all natural ingredients. So I tried it and the experience and the results were amazing! I liked it better than cold waxing! The warmth of the sugar wax was soothing and easy on the skin! It was so nice that from then on, I started availing the service till this day. Ms. Emily, the expert aesthetician, does the hot waxing job for me. She has a very light hand and really knows how to do her thing. As an added testimony to their services, my "chicken skin" is slowly diminishing. Maybe not all, but most of the visible protruding pores has vanished. And I largely credit it to the hot sugar waxing done by Hey Sugar Waxing Salon Centrio Branch. If you want to try hot sugar waxing or eyebrow threading from Hey Sugar without damaging your budget, I suggest you join this month's National Hair Free Day this coming November 27 at 11AM to 3PM. You can choose to avail of a FREE underarm hot or cold sugar waxing or eyebrow threading from Hey Sugar Waxing Salon. 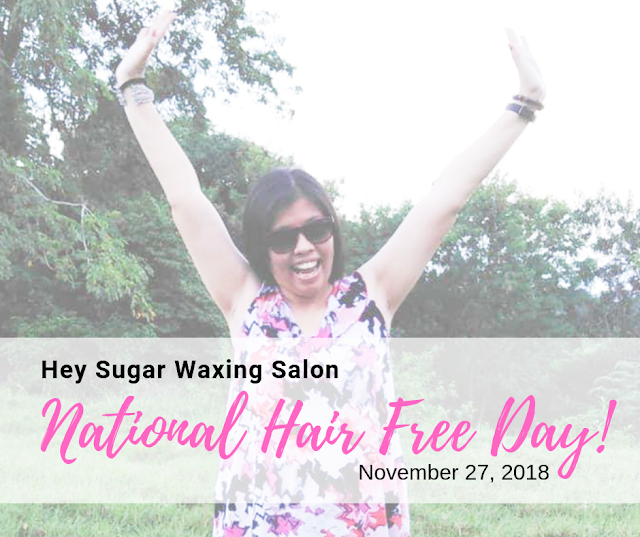 To get a FREE SLOT for that day, you must go and visit Hey Sugar Waxing Salon prior to the event. They are located at the 2/L of Ayala Centrio Mall.